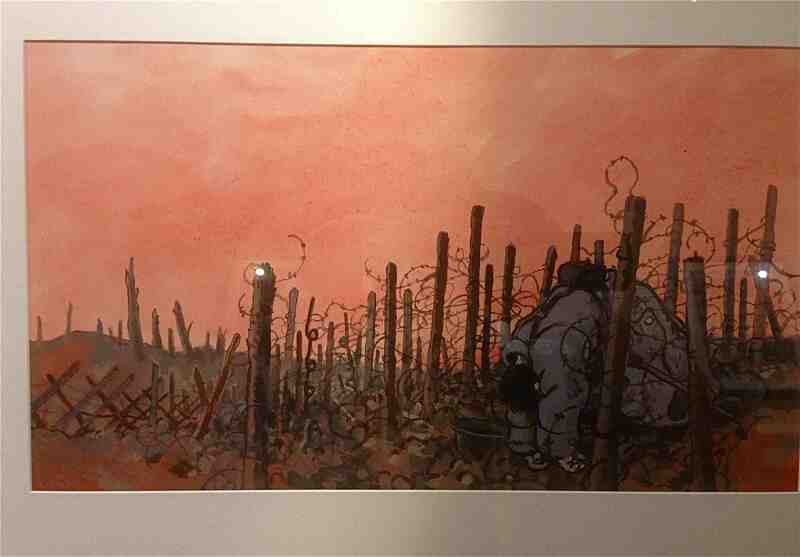 One awesome aspect of the recent Internationaler Comic-Salon Erlangen that I attended in the old university town of Erlangen, Germany, near Nuremberg, was the staging of two contrastingly presented exhibitions of comics art on World War I by Joe Sacco and Jacques Tardi. 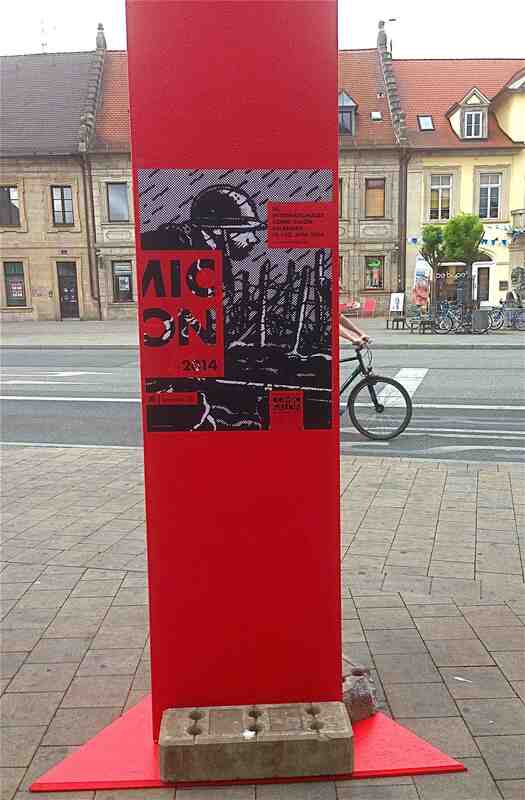 COMIC SALON exhibition signboard, with Tardi image, in the city (Photo-© 2014 Michael Hill). 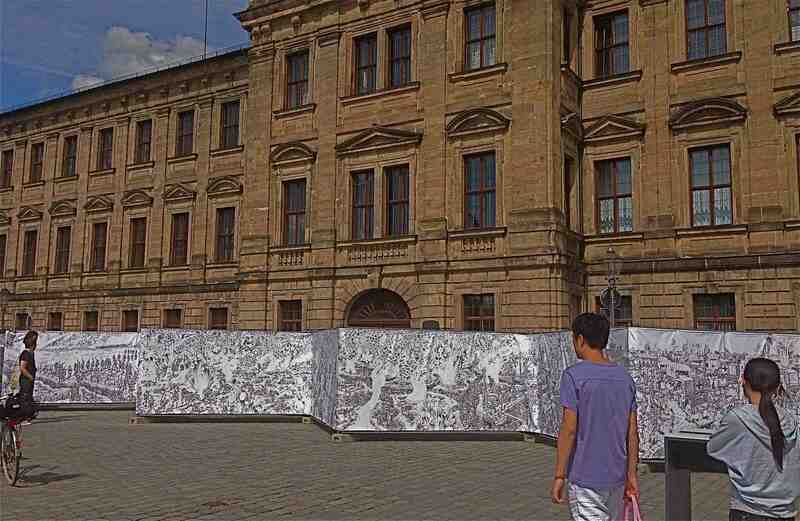 Joe Sacco’s The Great War was displayed as an open-air exhibit in Schlossplatz, enlarged on display boards arranged in a long series of folds. 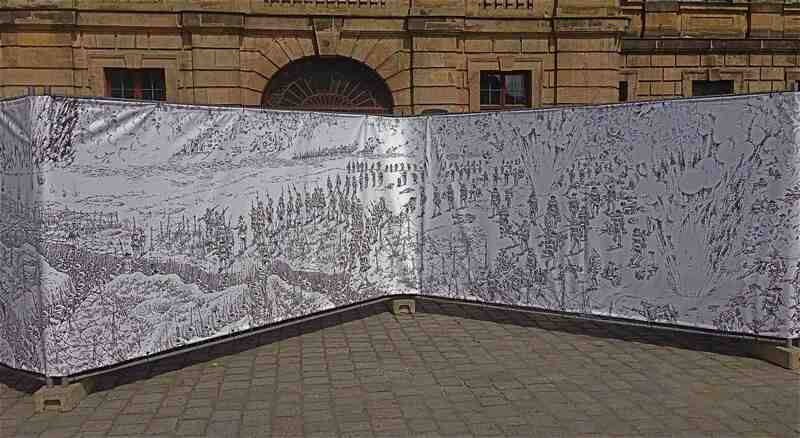 Seeing it spread across the square magnified the herculean task that Sacco undertook in drawing this epic, concertina work of one day of the Battle of the Somme and fitting it all into one panel. 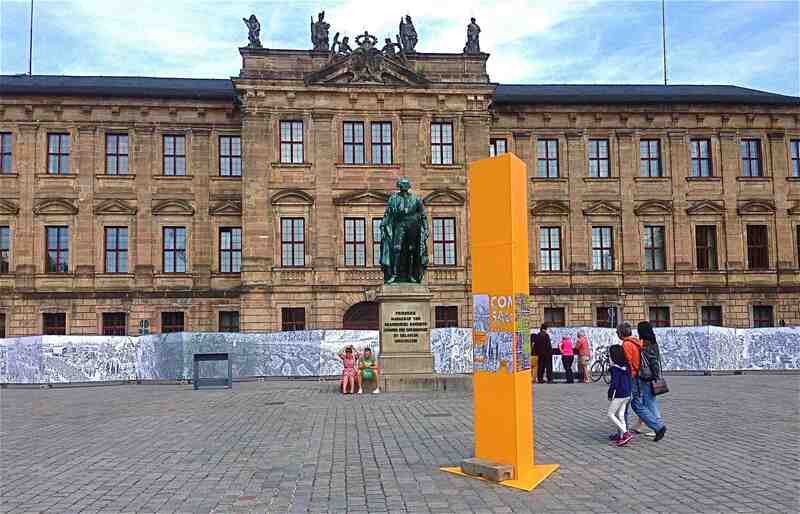 Open air exhibition at Schlossplatz of Sacco’s The Great War (Photo-© 2014 Michael Hill). His wordless comic is structured around a single seemingly endless panel that has been folded into 24 segments that unfolds to form a single piece. It depicts events in a continuous, cinema-pan like take, spread across time and space with soldiers assembling, then attacking and returning to their lines. The unfolded published comic is too long for a table and has to be spread across the floor of two adjoining rooms or a long corridor. In Schlossplatz it ran right across the width of the square necessitating a reading whilst walking approach and with so much detail it required several passes to take it all in. Fold-out art work of Sacco’s The Great War (Photo-© 2014 Michael Hill). Closer view of fold-out display of Sacco’s The Great War (Photo-© 2014 Michael Hill). The panels above show the trenches and the movement of the soldiers from them into the hostilities of ‘No Man’s Land’, their exposure to artillery attacks and its associated schrapnel, plus machine gun and rifle fire. 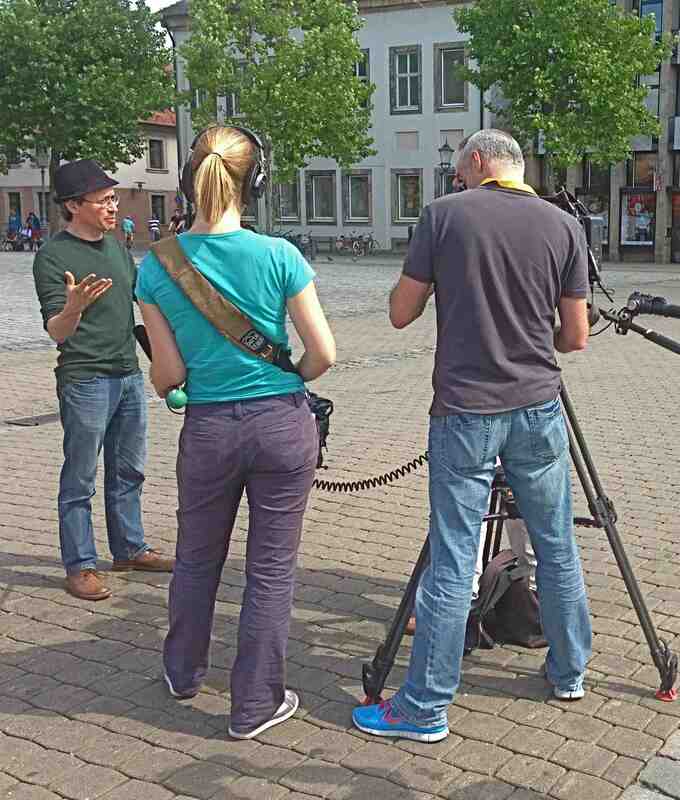 Sacco being interviewed on site of The Great War exhibition. (Photo-© 2014 Michael Hill). 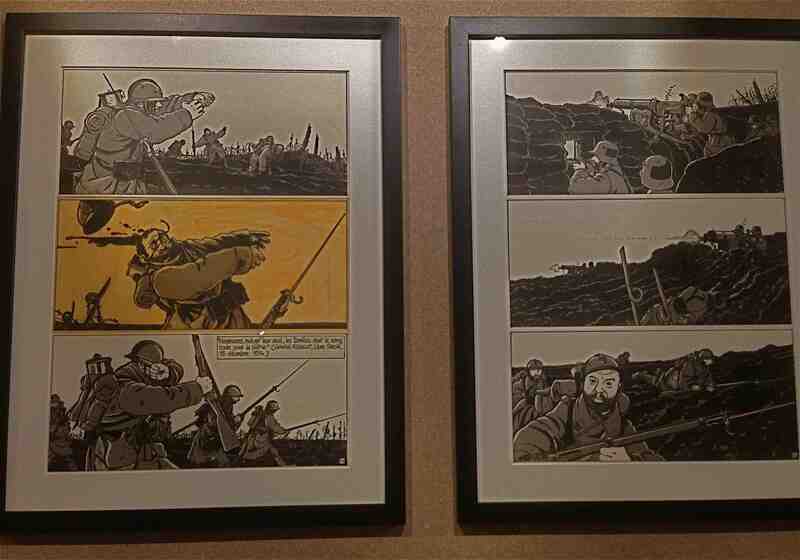 On the other hand the war comics art by Jacques Tardi was exhibited indoors. Low level lighting created a sombre mood appropriate to the theme and also perhaps to protect the original art work that showed corrections such as the whiting-out of errant black border lines and some alignment and registration marks. This was the original art on display, not it’s cleaned up and reduced size reproduction as seen in the published comics. 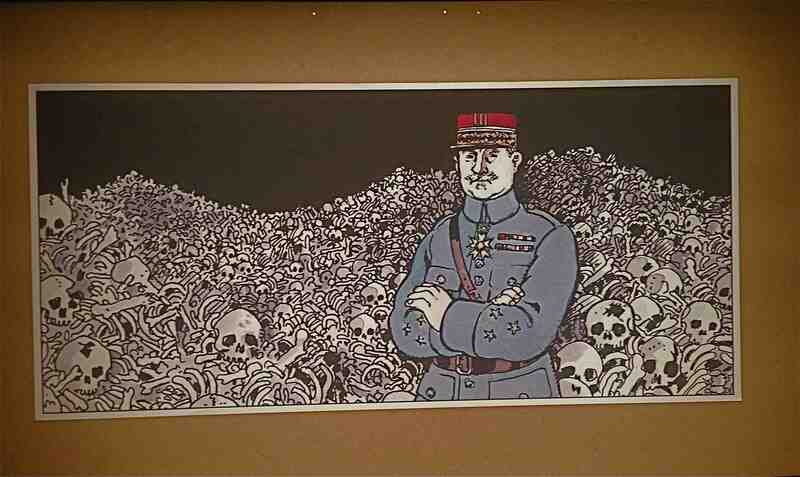 Landscape of Death: Jacques Tardi and the First World War exhibition (Photo-© 2014 Michael Hill). Image from Landscape of Death: Jacques Tardi and the First World War exhibition (Photo-© 2014 Michael Hill). The work, titled Landscape of Death, was very bleak, expressing the agony of those who fought in World War I. Many of the images were painful to view such as soldiers’ bodies being torn apart by flying pieces of shredded metal, lacerated, disfigured or rendered limbless, and with some surviving in this state. Images from Landscape of Death: Jacques Tardi and the First World War exhibition (Photo-© 2014 Michael Hill). Exhibited in a darkened theatre inside the Civic Centre, the low level of the light created a reverence for the images as well as a canopy of protection for the original art work as protection from fading. The work was housed in a series of narrow wooden walled and roofed walkthroughs with some shapes cut into the walls so that one could see out to lessen the confined effect. 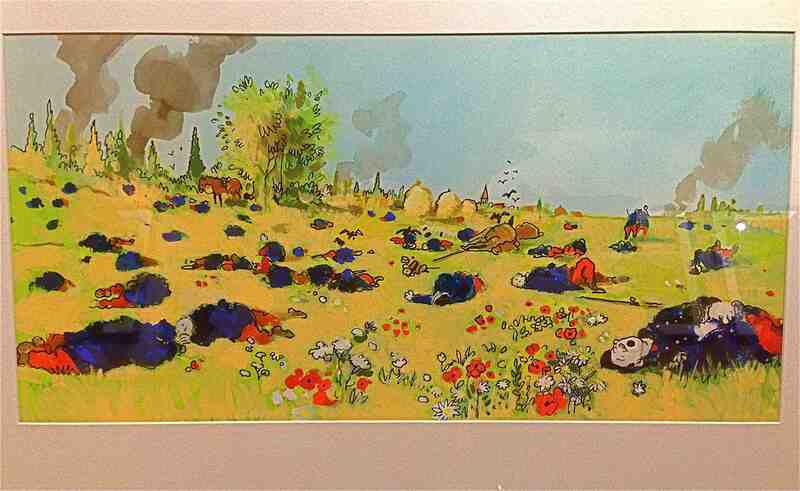 Tardi’s use of colour was impressive with his delicate watercolour brushwork adding a poignant hue to his poppies, pools of blood and rising smoke. 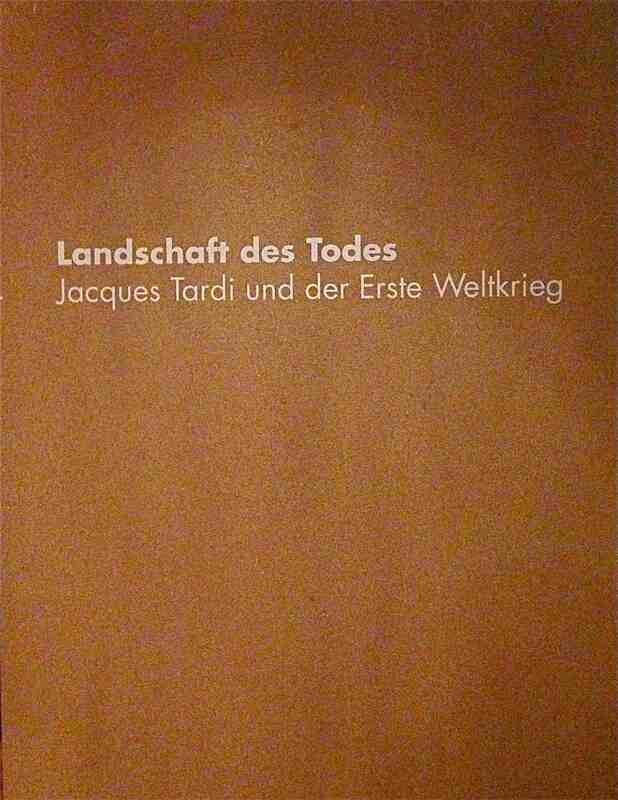 These two exhibitions, Sacco and Tardi respectively, with contrasting presentations: open-air/ indoor; spacious/ confined; sunlight/low level artificial illumination; expansive/confined; complete/edited, served to express and communicate aspects of the texts: open, the vulnerability of soldiers out of the trenches and restricted by the narrow confines of the trenches; and time-one day or six years of living with gas masks, flame throwers, helmets, barbed wire, dampness, misery, the stench of rotting bodies, despair and the ongoing expectation of death made a memorable imprint on me. Pages from my Germany journal with Tardi press clippings and sticker (© 2014 Michael Hill). 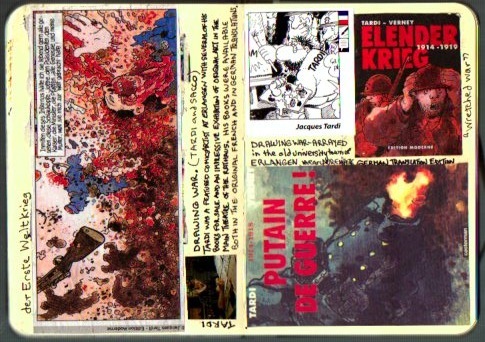 UPDATE MAY 2017: I FOUND THIS JACQUES TARDI STICKER (below) FROM THE SET THAT THE ERLANGEN ORGANISERS WERE DISSEMINATING, 300 IN ALL IF I REMEMBER CORRECTLY, SO I HAVE ADDED A SCAN.